Jaded Blossom: Guest Designer Melinda! Greetings all, Melinda here from Scrappinmelon. Hoping everyone had a very Merry Christmas filled with family, friends, good food and all the trimmings. I was so thrilled to find out that I was one of the lucky ladies chosen to be a guest designer for the day here on the Jaded Blossom blog. A big THANK you to Michelle and Candace for the opportunity. Since my day is after Christmas I chose to make my projects for New Years. I can't believe that we are going into 2015!!!!! So much has happened this year, time has just slipped away and the new year is upon us! I work at the hospital and will be working all the holidays including New Years Eve. So I decided to make a few fun treats for everyone at work. I started by making these Midnight Kisses. I went to the dollar store and bought some Champagne glasses and filled them with silver and purple paper shred. 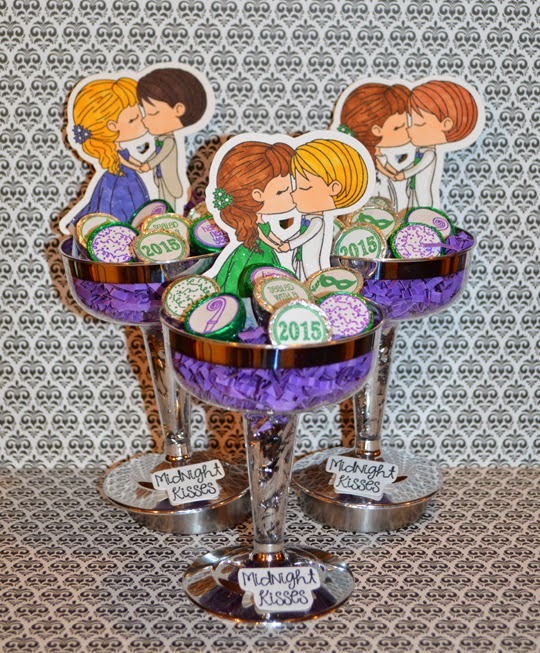 Using part of the November release, I then embossed a bunch of kisses with the Happy New Year, Happy Hour Candies and the Valentine Candies stamp sets. 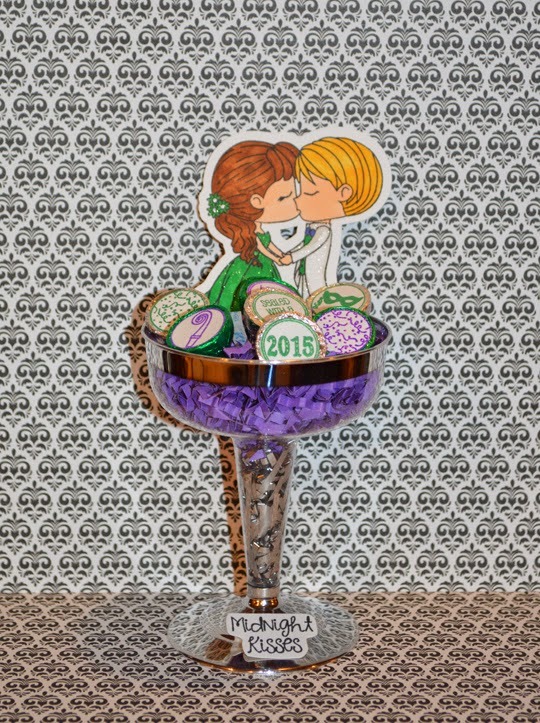 Then using my Cameo I cut out the shadow layer for the couple on The Perfect Match stamp set. Next I attached them to a pick and placed them in the glass with the kisses. 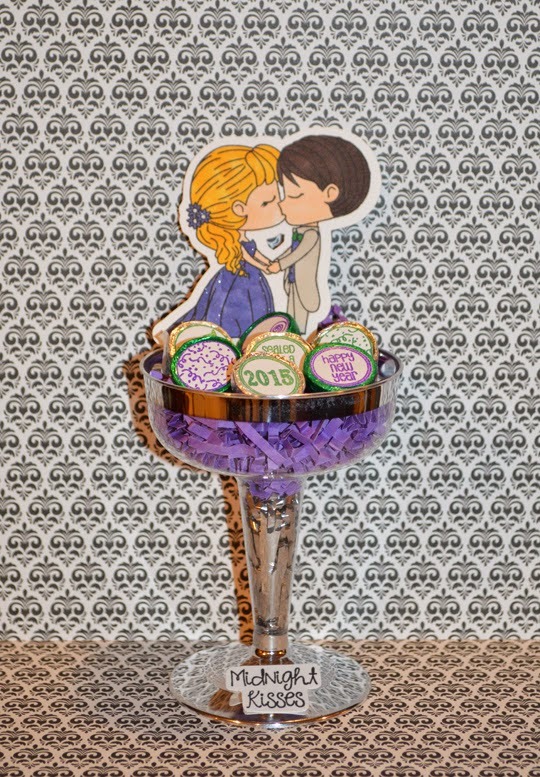 The sentiment is from the Happy New Year set and it's a perfect match for my couple. 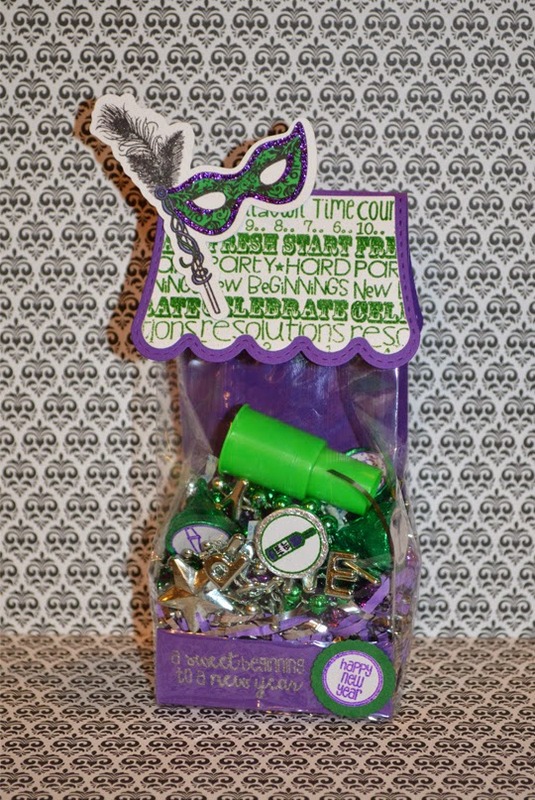 Then for some fun, I used the gusset bags and filled them with beads, some more kisses and a noise maker. For the topper I used the Scallop Slider and Topper Die and made my pattern paper by embossing the Holiday Treat Tags. Next I cut out the shadow layer for the mask from the Happy New Year set, colored it, gave them a Wink of Stella, some Stickles and popped it on top. I used the Happy New Year stamp set for the sentiment on the insert for the bag. There are endless ideas using Jaded Blossom products, I love being able to see everyone's crafty take on all the products and of course I love getting my happy mail!!!!! Merry Christmas, Happy New Year and cheers to finding lots of time to craft in the upcoming year! This is PERFECT for New Years Eve!!! Love it!!! WOW! 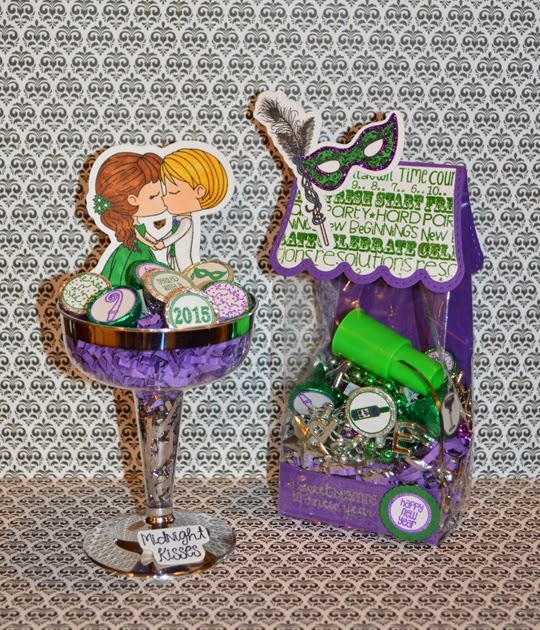 Fantastic projects for New Years Eve! These are really sweet ideas!!! I love them!!! What a sweet idea! Great job! Great idea!!! Beautiful colors too!!! Great colors and great idea. Awww, how fun and awesome are these? Such a great treat for the new year. Stunning projects - love the idea of the glasses. OMG, these are adorable! Great job!! Eeek! 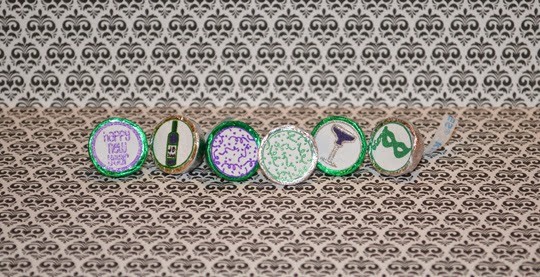 These are FABULOUS!!! 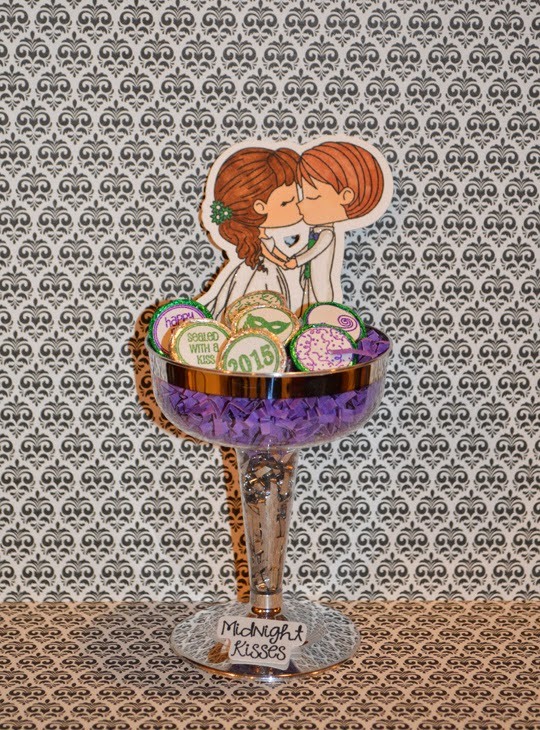 I love how you used the wedding couple for a New Years couple and the colors rock! Awesome job! These are so awesome-- oh how I wish there were more hours in the day so I could create some of these cuties!